Featuring immersive visual art installations and live performances for one wild weekend per month, Alter: Art Space is all about participation, interaction and inclusion. 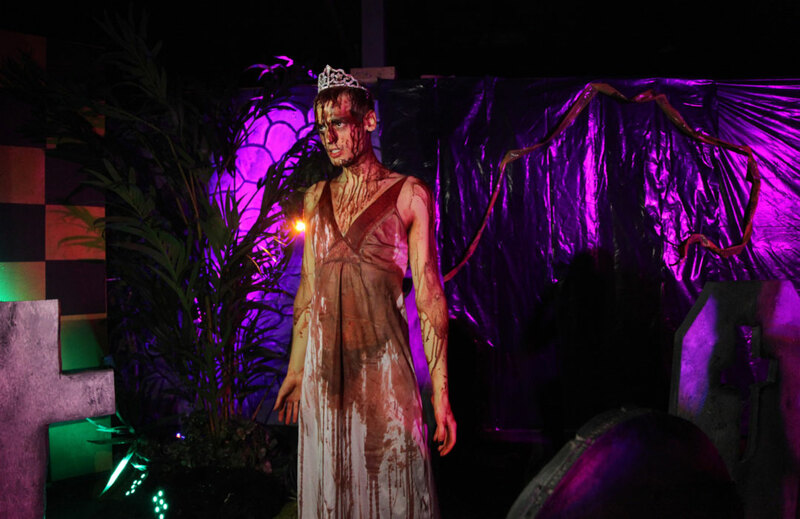 Scott Knettle came as “Carrie” to the “Alter Ego” Halloween event. A 2017-18 Rocket Grant, funded by the Andy Warhol Foundation for the Visual Arts and administered by the Charlotte Street Foundation and the Spencer Museum of Art, helped launch the project. Alter also tapped into the mother ship of Big Fun Art, the Santa Fe artist collective known as Meow Wolf, whose innovative, installation-based model is rapidly expanding to multiple cities. While at the Art Institute, Boi Boy and Hubbard were among the few artists doing large-scale installations, and found they worked well together. They had some things in common: a desire to get back to the play of art making, the joy of making (stuff) for the sake of making (stuff), and avoiding the isolation of individual studio practice. They also shared an ethos of breaking down barriers — between artistic categories, and more importantly, between people. Their DIY vision for the rough-and-ready warehouse space at 1416 St. Louis Ave. is one that facilitates collaborative creativity, offering audiences expanded art experiences — one wild weekend per month. They savvily bring together immersive visual art installations with live performance art tilted toward outrageous costumes, brilliantly modeled by the Alter moms themselves. An unpredictable programming mix of DJs, film screenings or live music amps up each themed event. Without question there is always a dance party. Wallflowers, be very afraid. You are likely to be snatched up and accessorized by a costumed character. This is not where you’d go for intellectual theory or cultural contemplation. There is a lot to see, but come ready to be seen — to let your freak flag fly. Big Fun Art is all about participation, interaction and inclusion. Alter is tailor-made for a visually oriented generation of digital natives who instinctively share virtually everything via social media. Who wouldn’t want a pic with Alter’s exotic mascot Ava the Funmingo? The world is a screwed up place; Alter Art just wants to have fun. “Calling it a party is a way of tricking people into looking at art,” admitted Boi Boy. He and Hubbard consider Alter’s events, which are queer-friendly, gender-inclusive and not centered on alcohol, to be a healthy form of escapism. “We’re not telling anybody what to think,” added Bo. Alter’s existence alone speaks for their politics. 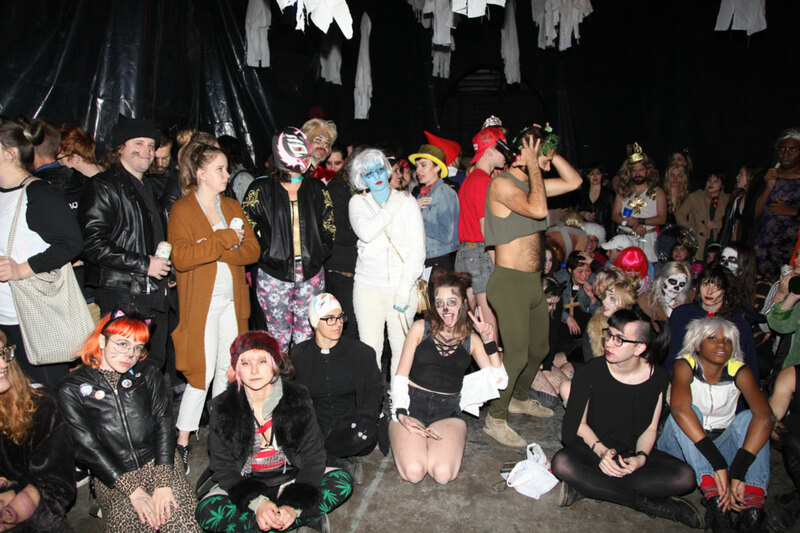 They’ve drawn inspiration from the trans and drag communities, and embraced club culture as a kind of social art practice. A quick survey of Alter’s first few months reveals a zany series of themed events falling on the last weekend of the month. Alter appropriately launched with “Birth,” in which the moms simulated the act by emerging head first from the cushions of a couch (yep, there’s a video). “Garden” featured a tea party screening of the Maysles brothers’ cult documentary “Grey Gardens” amid installations, murals, sculpture and digital art. “Alter: EGO” irresistibly became a Halloween costume extravaganza. “Hey Hay” cowboyed up for a good ol’ Western hoedown, and the year ended with an irreverent, quasi-religious New Year’s Eve bash, “Alter: Altar,” in sub-zero degree temperatures. Now several months into their temporary artist-run experiment, the Alter moms are taking a brief respite from their breakneck pace. Reflecting on their roller coaster ride, Hubbard explained, “We don’t necessarily know what it is and don’t really care. People have stopped trying to understand what it is.” They’re putting less pressure on themselves now that they’ve found a rhythm that is working. People are catching on; they are coming and participating, with more and more new faces in search of fun. The real challenge has been organizing the artists, then installing and tearing down each relentless monthly event, usually in just a matter of days. Their quick and dirty timelines free them from art object preciousness or conceptual b.s., but it makes for some very long days and nights. They’ve formed a new appreciation for the stamina required to manage a space like Alter. Fortunately, a core group of about 10 of their friends have volunteered to help implement the Alter vision. Although the Alter moms are the faces of the project, impossible to miss in their mind-blowing costumes, each event has been a crash course in troubleshooting. Early on they realized their building didn’t have plumbing, which led to: how do we get port-a-potties? They’ve learned what anyone who’s been involved in a DIY space can tell you: there are a million details of event planning and production, promotion, budget management, etc. Not to mention the stuff you didn’t plan for. You know you’re an artist-run space when your top expenses are paint, rope and duct tape. Alter: Art Space is located at 1416 St. Louis Ave. Admission is $5. For more information, facebook.com/alterartspace/ or email Alterartspace@gmail.com.